I know it is Thursday, but I have never really been good with working on a schedule. (I am not the teacher that has a unit outline and homework to give my kids at the start of each week, because how the heck am I going to know where we are in five days let alone one?) So forgive me this fault of posting my Made4Math Monday on Thursday. Anyway, I’ve posted about this each year. I figure I’ll do it again. My school has a rotating schedule, where we meet kids four times a week (50 minutes each). 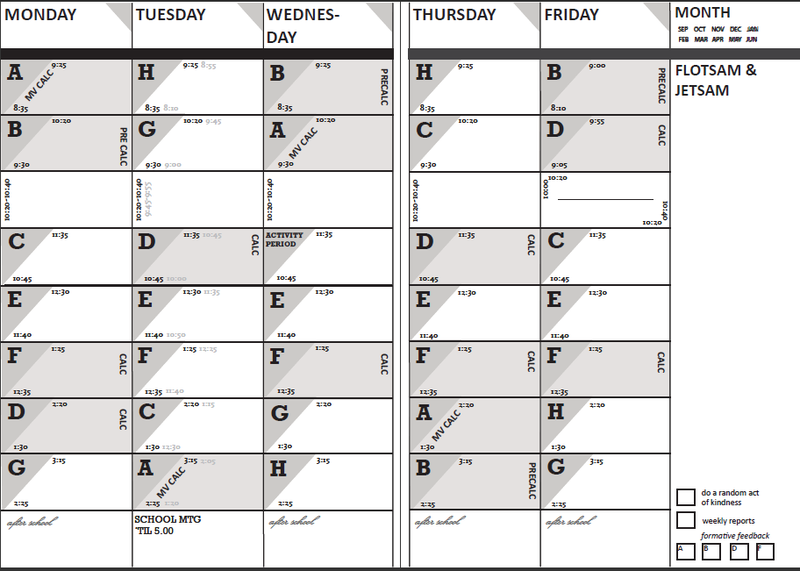 We’ve had this schedule for the five years I’ve been teaching at my school, and I still don’t know it by heart. I have gotten the class period start-end times down, but which class I’m meeting when is always a mystery. Also, with my brain, scheduling meetings with kids is something that has to happen in my planner so I don’t double book. What’s nice is after my first year, there were a few other people who wanted to order planners too, so I have put up a blank planner (meaning: without my classes inputted in them) for them to buy. I don’t make any money off it or anything. In order to make them, I had to use Adobe InDesign, which I had never used (the school laptops which we are issued come with it already installed). So I spent hours, years ago, making the original grid, picking the fonts, and working on the design. But those hours were worth it, because even though bits and pieces change each year, I have been super happy with the look of it. (I created the file to be A4 paper size, because I wanted it to be slightly bigger than regular paper so I could slip a sheet of regular paper in there without it sticking out.) Then you convert your file to PDF. Just remember: if you’re going to design your own, make sure you have a blank sheet before you start your calendar pages. This way the entire week will be on facing pages. So after I made the planner, I used lulu.com to order it. You just upload your PDF and specify what you want. I get saddle stitch (fancy way of saying heavy-duty staples). Designing your cover on lulu is really annoying — their “cover wizard” is difficult as all heck to use. 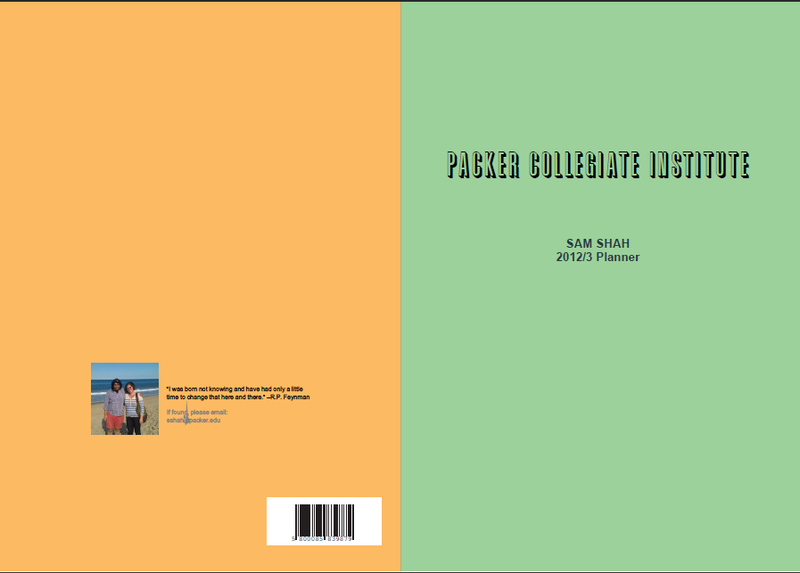 But even if you order a black and white planner (as I do), a color cover comes with it. And if you are a photo person, you can have a photo background! Each year, the price of printing between $7-$9. With shipping it comes to around $15 plus or minus a few bucks. And viola! Your own fancy planner! And that’s it! My planner, from creation to use. You simply need to upload a PDF file to lulu.com to get it published, so if you are good with Word, you could even create something nice in there! This is sweet. The next time I feel too busy or swamped at work, I’m going to pull this picture up and look at it…it will make me feel better. I don’t know how you do it. I will say, as a fellow planner designer, that it is very sharp and looks useful! :) I wish I knew my schedule far enough in advance to do the same. 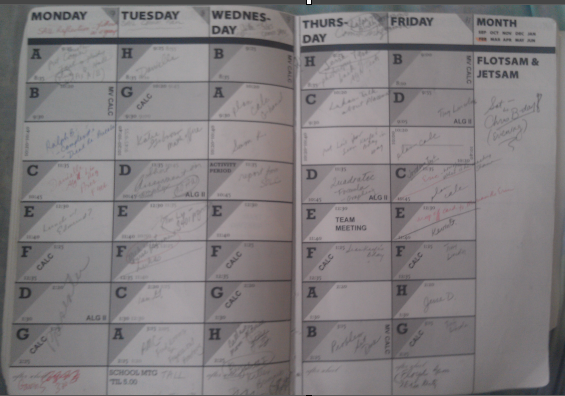 <3 that a random act of kindness is codified into the planner. I love this so much! I must right everything down, and I have never found a planner that has all the features I need. I tried designing my own recently, but I didn’t like the three-ring binder I was using. Thanks to your tip, I am having it published and anxiously awaiting its arrival. Thank you! I work at a school with lots of part-time faculty (myself included) so we can’t have any crazy rotating schedules or people wouldn’t know when to be there. We have certainly thought about having more rotation, but it’s tough. Very pretty! I think my school is going to be seriously reconsidering EVERYTHING about our schedule, because we’re going through a huge transition. But I have to say, I thought it was a little crazy at first, but there are some serious benefits to rotating. you are the best. that is all.